On certain items across the year, there are offers that when you buy one item or spend over a certain amount you get a free gift. During the Christmas period as more pennies are spent, they're are more free gifts. Here's what I got.. 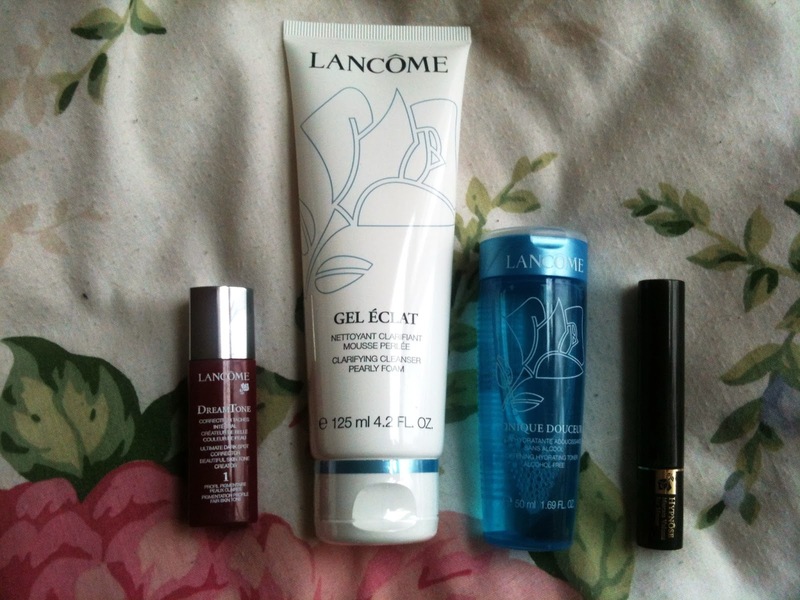 I've been a fan of Lancome for a few years now, but have not branched out far from their eye makeup, I have tried their mascara, eyeliner and eye make up remover but not much else. My mum got a massive Lancome gift set free after spending a certain amount on Lancome in Debenhams and we have since split up the contents and this is what I'm left with. The Dream Tone, ultimate dark spot corrector, beautiful skin tone creator is the item that I didn't think that I'd get too much use out of. It is designed to correct the appearance of dark spots, uneven skin tone and target imperfections to a leave a flawless finish. It comes in three serums to match your skin tone, this is number 1, which is designed for fair skin. This is only a 7ml sample, however, I feel like this will last me a long time, I only needed a small amount to apply on my face and only the areas that I felt like I needed to use it.I find that it blends easily and leaves a lovely scent across the skin. My skin feels smoother and has a slight glow after application. I find the application itself a bit messy, it's simply a plastic stick and I find it a little hard to use, however, this application is only on the samples and if you were to buy one yourself, you would get a very lovely pump. Would I repurchase this? To put it simply no. I don't think it makes a huge difference to my skin and with the price tag, I think I'll give it a miss, no matter how lovely it is. The next two items Gel Eclat and Tonique Douceur are both full size items. The Gel Eclat being 125ml whilst the Tonique Douceur being 50ml. Let's start with the Gel Eclat, it's defined as clarifying cleanser, pearly foam which aims to free skins of toxins and impurities. The first thing I noticed about this is that it had a lovely floral scent which I presume is down to the white Lotus, Rose de France and Japanese Cedar bud ingredients. I've got a confession to make, I rarely use cleansers, toners or anything on my skin. I've always been pretty happy with my skin and have been extremely lucky to not have many problems with it, therefore, liked to stay away from using a lot of products. However, after using this I could really tell a difference. As the product states, it is a pearly gel and only a little bit is needed with water to cover your whole face. I really enjoyed using this product, it left my skin feeling extremely nice and clean, however, I wasn't that blown away to feel the need to repurchase it. The Tonique Douceur is a softening, hydrating toner and aims to 'gently tone, refine skin texture and remove any remaining impurities'. It has a slight fragrance, but wouldn't say it was particularly nice, its smells slightly chemically, however, you can't smell the fragrance after application. It is recommend to place a small amount on a cotton pad and use all over the face, but there is only a small hole to get the product out, so I either use too much or too little, another way of application would have made this a lot easier and more enjoyable to use. Saying this, I did actually really like this, it makes me skin feel softer and doesn't dry it out. 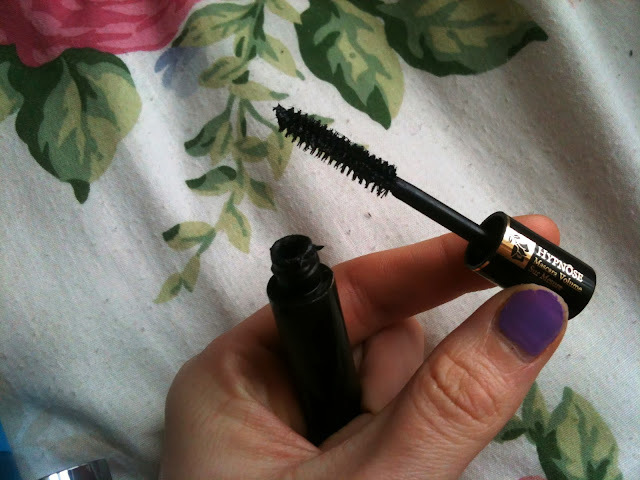 And finally is the Hypnose Volume Mascara. This is once again a small sample of 2ml and it claims to build up 6 times more volume without clumping. I do like this product, but I wouldn't splash out and buy the full size mascara. I find the application wand was really easy to work with and glides through my lashes really well. My lashes do look more voluminous, however, slightly clumpy and I do find that I have a use a lengthening mascara as well to get my lashes how I would like them to look. Have you tried any of these products? Or any that are similar to recommend?